December 16: Symposium at workshop on The role of predictability in shaping human language sound patterns at SST, Sydney, Australia. 09/1-3/16: AMLaP, Bilbao, Basque Country. 07/13-16/16: LabPhon, Cornell University, Ithaca, NY. 06/21-24/16: Colloquium in Linguistics, University of Potsdam, Germany. 06/12-16/16: Plenary at ISLE Summer School, Amsterdam, Holland. 6/17-19/15: Plenary at Discourse Expectations (DETEC) 2015 at University of Edmonton, Alberta, Canada. 5/18-21/15: Inaugural Labs-meet-Lab with labs of Michael Wagner, Meghan Clayards, and Morgan Sonderegger at McGill, Montreal, Canada. 2/9-10/15: Psychology, University of Geneva. 7/24-26/14: CogSci, Quebec City, Canada. 7/16-18/14: International Workshop on Language Production, Geneva, Switzerland. 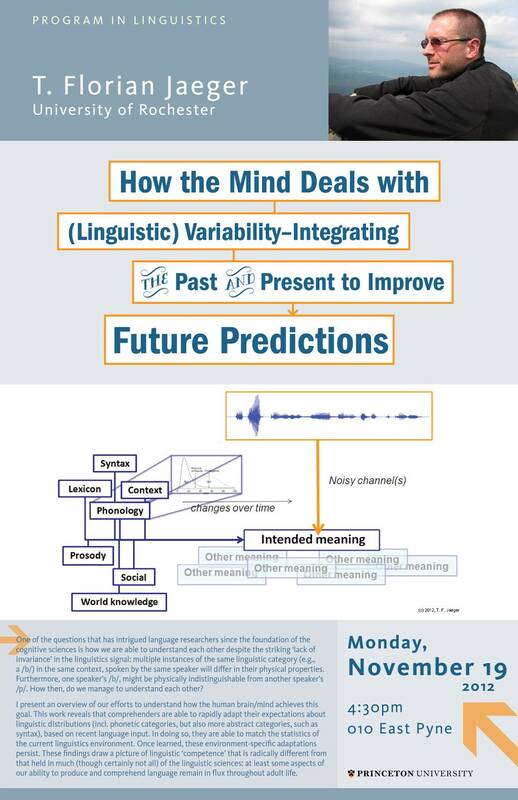 5/1-3/14: Department of Cognitive Science, Johns Hopkins University, Baltimore, D.C.
4/17-19/14: Linguistics, University of Maryland, Washington, D.C.